If you need a can liner that’s tough as nails, this is the bag for you. 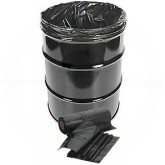 Industrial drum liners are premium heavy duty bags that are designed to take whatever abuse you can throw at them. 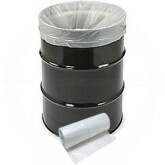 Strong and durable, these are the best can liners for industrial and factory use. Manufactured using top quality resins and maximum film strength for tough applications. Puncture and tear resistant virtually leak-proof star seal is available in a wide range of strengths and sizes. Packed for easy stacking and storage.